Risotto is a traditional Italian rice dish that is fairly easy to make, although many people wonder what ingredients to add to risotto. The dish has only a few basic ingredients that go in every risotto recipe, creating a backdrop to which you can add your own creative ingredients. The beauty of risotto is that there are so many different variations, you never have to have the same dish twice. Risotto is made using a slow cooking technique that allows the rice to release its starches and become creamy. There are five basic ingredients in risotto. A good risotto starts out with some type of fat. Olive oil or butter are traditionally used, although some cooks like to render pancetta, which is an uncured Italian bacon, and use the fat from that. You can also use clarified butter. To start cooking your risotto, heat your chosen fat in a large pan. Minced onions supply the aromatic flavor base for risotto. Depending on the ingredients you will be adding, yellow onion, sweet onion or shallots are a good choice. Red onions tend to be a little bit too strong for delicate flavors like seafood, but may hold up well to the intensity and earthiness of mushrooms. You can also try a combination of different types of onions. Try a mince of yellow onions, scallions and sweet onions, for example. Sauté the onions in the fat until they become translucent. Rice is the most basic ingredient of risotto. The type of rice you use is very important to the success of the dish. Risotto requires a high-starch, low-amylose rice. Amylose is a sticky polymer; sticky rices like sushi rice will not work for risotto. Choose a medium-grained, round, starchy rice. In the North America, Aborio rice is used almost exclusively for risotto. It is often labeled as "risotto rice." In Italy, other rices are more commonly used in risotto including Nano, Carnaroli and Vialone. You can even make risotto using the pasta orzo and following the same techniques. Add the rice to the onions and fat and sauté it for a few minutes to toast the rice and coat it with fat. Hot stock is the traditional liquid added to risotto. The flavor of the stock depends entirely on the type of risotto you are making. 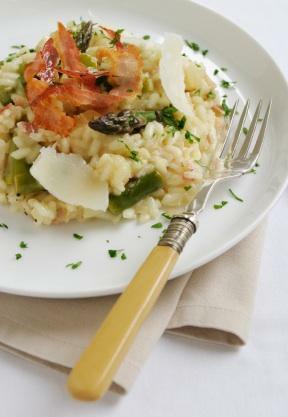 Seafood stock is good for seafood risotto, while vegetable stock works well for light risotto. Use the soaking liquid from dried porcini mushrooms for mushroom risotto. You can also add acidic liquids like lemon juice or white wine vinegar to the stock to brighten up the flavors, or add some red or white wine. All liquids that are added to the risotto should be hot. Add the hot liquids a ladleful at a time, stirring and giving the rice time to absorb the liquid before adding more. Once the rice has reached an al dente stage, it is time to add cheese. Traditional hard Italian cheeses like Parmigiano-Reggiano or Asiago cheese are commonly used. You can also try Romano cheese, Mizithra cheese, or a blend of hard Italian cheeses. Some cooks prefer soft cheeses like Mascarpone to finish off risotto because they like how creamy the cheese makes the dish. To add cheese, remove the risotto from the heat and stir in the fresh, grated cheese until it melts and blends in well with the rice. Depending on the type of cheese used and the seasoning in your stock, your risotto may require a little salt. Taste the risotto at the end of cooking and determine whether it needs seasoning. Add salt a little at a time and keep adjusting for flavor until you achieve the right balance. Mushrooms make an earthy, hearty risotto. Use reconstituted porcini mushrooms and whatever fresh mushrooms are currently in season. You can use the strained porcini soaking liquid to impart even more mushroom flavor. Fresh herbs can entirely change the flavor and character of your risotto. Try fresh mint with tender green peas, or add some fresh basil with chopped tomatoes. Thyme pairs well with earthy flavors, while tarragon works well with white wine and seafood. Add fresh herbs right at the finish of the dish and stir them in well. Citrus can add a hit of brightness to a light risotto with fresh summer vegetables or seafood. Try adding in the zest of a lemon and some lemon juice as you add the hot stock. Vegetables can add color and flavor to risotto. Asparagus is a favorite, and can be incorporated before you start adding your stock. Pair asparagus with lemon and light herbs like basil. Truffles take risotto to the next level. You can shave fresh truffles over the top of finished risotto or drizzle the risotto with truffle oil. Cooking risotto follows a basic preparation and uses simple ingredients; tailor it to your meal and personal tastes by adding extra ingredients. Your only limit is your own creativity.